Interesting results to the survey. For one, 62% of survey responders indicated that they are selling their photos online. I wasn’t expecting it to be that high. Only 38% indicated that they are not currently selling their photos. That tells me we’ve got lots of pros and/or enthusiasts trying to make some side money on their hobby. Sound right to you? 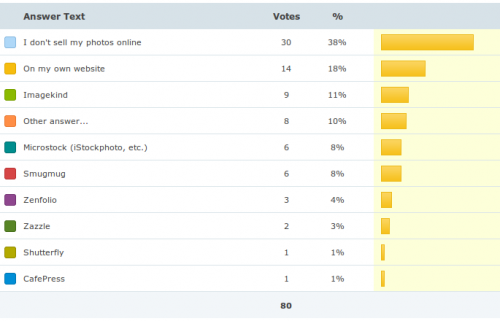 The main point of the survey was to find out how you all are selling your photos online. The biggest group (18%) sell their photos on their own websites. I do this myself. You get to keep all of the profit but it’s the most work of all of the options. That’s the main reason I’ve been thinking of joining the second largest group (11%): ImageKind users. ImageKind lets you keep most of your profit over their base prices. Of course, they squirrel away some profit for themselves in the base price itself and they take 5% of any amount that is 100% or more above the base price (that’s a complicated sentence—they explain it better in their FAQ). I don’t begrudge them making a profit on their service. They seem to take almost all of the drudgery out of selling your work. They also provide a ready audience for you. Sort of a double-edged sword though since they also sell so many other photographers right next to you. Those of you who have used ImageKind, do you recommend their service? 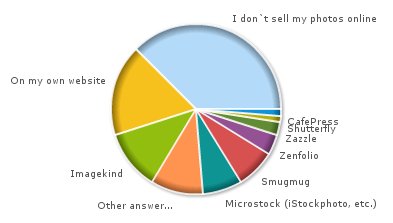 Many of you sell on microstock (iStockphoto and their ilk, 8%). Not surprising. Smugmug comes in at 8% as well. I like the idea of Smugmug. I’m a fan. I’ve done their free trial. But for reasons I can’t really put my finger on, I’ve never signed up for service. I guess I like Flickr better for sharing and the selling part of Smugmug didn’t impress me the last time I took a look. Shutterfly has a service for professional photographers. They charge an annual fee ($99 or $199 for more space) and take 15% of the profit. But their base prices are lower than ImageKind’s. Probably works out about the same. Zazzle and CafePress came in near the bottom. I expected Zenfolio to have more users (3%). It’s bona fide turnkey photography hosting, after all. One possibility: I couldn’t find Zenfolio’s base prices listed on their website. Anybody want to share why they passed on Zenfolio? Finally, in the “other” category we had: RedBubble, Nuzart, Etsy, and Lulu.